For London-based artist Bruce Ingram, studio debris provides both the reference and the raw materials for the creation of abstract compositions that rely on chance juxtapositions and experimentation. Ingram’s works reference a modernist concern with shape and form, often blurring the boundaries between the figurative and the abstract. In this exhibition, Ingram will present collaged works on paper alongside a new series of wall-based works that explore the boundary between painting and sculpture. This new series of ‘relief’ works are made from off-cuts of wood and found materials. Ingram is attracted to the randomness of finding readymade shapes; discarded and salvaged materials often providing a starting point to further explore surface and form. Through the process of play with these materials in the studio, pieces are assembled and morphed together. Ingram chooses to physically edit his works by collapsing and joining works together, producing outcomes that are a manifestation of starting points and compositions. 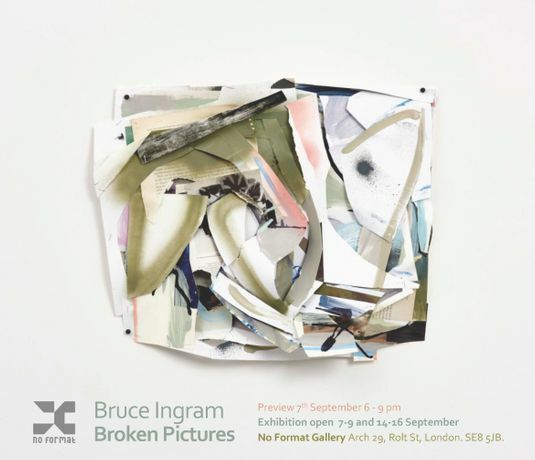 ‘Broken Pictures’, acknowledges the fragmentation and deconstructive nature of Ingram’s studio process. Scattered across the gallery walls, the works on display will shift from the traditional confines of the picture plane into exaggerated shapes and compositions that play between image and form.